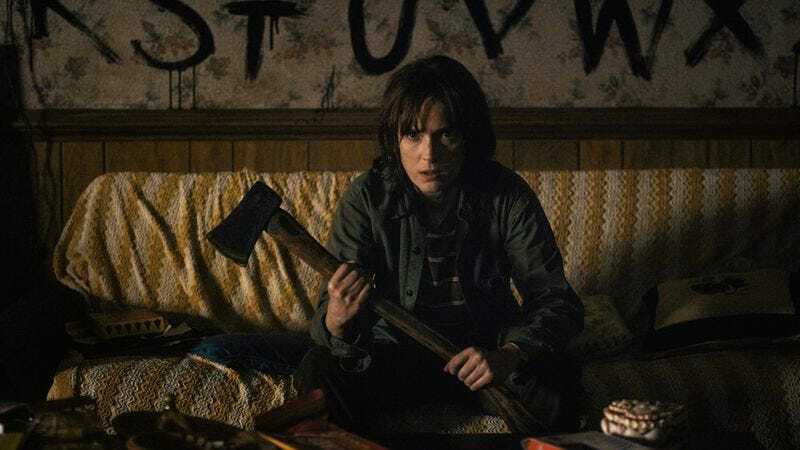 This episode quiets most quibbles I had with Joyce Byers’ characterization, or with Winona Ryder’s performance. Joyce is introduced already on the edge. As a deputy jeers in “Chapter Two,” she’s been on the edge for a while. But in “Chapter Four: The Body” (we’ll talk about that title later), Joyce isn’t on the edge. She’s gone over the edge. And the people around her can’t know she’s fallen into an abyss of horror, not madness. As the episode opens, Hopper tells her about the small body pulled from the water, about his theory of how Will fell to his death in the quarry. The music here is soft, reminiscent of Angelo Badalamenti’s haunting Twins Peaks score. He breaks the news as gently as possible—“The earth must’ve given way, Joyce. Joyce? Do you understand what I’m saying?”—but she barely hears him. “It’s not Will,” she tells him, wide-eyed. “I talked to him a half-hour ago. With these.” She holds up her jumble of Christmas lights. In a smart visual touch, the dim light in the room picks out the now-dead strings of colored lights in the foreground and background, emphasizing their dull darkness. (Like “Chapter Three,” “Chapter Four” is directed by Shawn Levy; it’s written by Justin Doble.) Ryder walks a narrow line in this scene. Joyce’s trembling voice, her darting eyes and knitted brow, her frantic gestures all conspire to make her look dazed and broken. It’s the shock of inexpressible horror, mingled with relief at speaking to her son. But to Hopper and Jonathan she sounds like a mother digging deeper into denial, burying the brutal facts in dark fantasy. Jonathan can’t believe her. What she’s saying isn’t just incredible. It’s impossible. It’s deranged. Fleeing from his mother’s ranting, Jonathan escapes into his headphones, blasting Joy Division’s “Atmosphere”—maybe because the single’s B-side, “She’s Lost Control,” would cut too close. “She’s had anxiety problems in the past,” he reminds Hopper the next morning at the morgue, “but this… I don’t know.” It says a lot about Jonathan that minutes after bolting from the sight of his younger brother dead on a morgue slab, he’s reassuring the chief of police (and his mom’s ex) that they’ll be fine. Ryder’s wild-eyed, jittery portrayal all comes together here. When she bursts out of the morgue, the attendant rushing to calm her, she’s playing this scene on the proverbial edge. High-pitched, shrill, hysterical: All the coded words for distraught women who refuse to be quieted fit Joyce Byers. She’s a Cassandra, howling the truth, knowing how irrational she sounds. Hopper doesn’t believe Joyce, either. But he trusts her, and her conviction keeps him alert. For an example of the show-don’t-tell philosophy Stranger Things embraces so effectively, watch Hopper’s eyes as he adds up tiny irregularities in the case, like state troopers claiming jurisdiction over Will’s corpse, the tight security and unknown coroner, or State Trooper David O’Bannon’s evasions and outright lies. Millie Bobby Brown speaks volumes with her eyes; Harbour’s Hopper speaks a different silent language, but just as clearly. Now we get to El. And that makeover. Look, I get it. I see the homage to Gertie dressing up E.T. But the E.T. scene is played for comedy, with the costume undermining his gravitas (“You should give him his dignity,” Elliott complains) to contrast a moment of dramatic importance and plot development. El’s scene is played painfully straight, with all three boys and El herself dazzled by her transformation. When she gazes at herself in the mirror and murmurs, “Pretty. Good,” it isn’t just a repetition of Mike’s stumbling compliment. It’s a reiteration of Stranger Things’ insistence on El’s girlhood setting her apart and defining her. Raised in a cell, starved for human contact, traumatized by her training, Eleven has little grasp of even simple words or norms, but somehow pretty is one she knows and prizes dearly. This treacly, reductive scene still squeezes comedy out of Brown’s reactions as she shoots quizzical looks at Mike or flinches from the feathery touch of the brush. By the time they reach the A.V. Club room (hey, that’s us! ), Dustin and Luca miming tears to teach El to “look sad” and the kids’ panicky improv to distract Mr. Clarke completely won me back. The comic volley of their patter epitomizes Stranger Things’ ability to temper its horror with character-driven comic beats. The interplay of the characters helps ground this fantastical plot in plausibility. That makes it doubly disappointing when the real-world dynamics fail for no reason. The conveniently inconsistent attention of adults is one such failing. Where are the grown-ups of Hawkins High School when Mike faces off with his bully? As a crowd gathers around them, loudly gasping in unison, where are the principal, the teachers, the grief counselor brought in to attend to these kids? Afterward, the camera reveals they’re standing by, just yards away. The show’s reality can withstand all the fleshy supernatural portals and special-effects monsters and pee-squeezing telekinetics the writers throw at it, but it’s hard to suspend disbelief in even mundane realities when they driven purely by the need of the plot. In “Chapter Four,” the pieces start coming together. Taping together the scraps of Jonathan’s photo, Nancy spots the creature that came after her in the woods, and finally asks Jonathan about Barb’s disappearance. Jonathan starts the episode worried about his mother’s delusions and ends it enlarging a photo of the monster she describes. (Shades of Blow-Up—or, more appropriately for Stranger Things’ pedigree, De Palma’s audio-centered riff on the idea, Blow Out.) Mike, Lucas, and Dustin start the episode convinced of Will’s death and end it listening to him on the Heathkit, augmented by El’s psychic power. Hopper starts the episode certain Joyce is in denial and ends it proving her right. (The resignation with which he coldcocks the state trooper adds a light note to a somber scene. I love Hopper.) Bit by bit, they’re getting closer to the answer—and closer to Hawkins Lab. In my review of “Chapter Three,” I mentioned the grid motif popping up throughout Stranger Things. In “Chapter Four,” variations on that pattern show up all over: in the school cafeteria where Nancy speaks to the deputies, in the morgue, in the mismatched prints of Mike’s sheets and comforter. Even the tumult of the Byers house is chaos punctuated by the prominent squares of overturned chairs and crates or grids of open shelves picked out by hazy light. But it’s most obvious at Hawkins Lab. From the establishing exterior shot to the square aperture of the security elevator to the broad squares of wall tiles and the small squares of reinforced glass and command panels, Hawkins Lab is a series of grids. Playing Dungeons & Dragons, the four boys create their own impossible worlds on graph paper. But under the leadership of Dr. Brenner, Hawkins Lab has conjured up impossible worlds and brought them right here. The high school principal talks about Will’s death leaving a hole in the community, but the real hole in this town is in that underground lab. It’s where the portal originates, where the dangers of Stranger Things spring from, where another world breaks through. It’s where the earth gives way. Vulture has a great round-up of Stranger Things’ major film references. If you’re pacing yourself, beware. Here be spoilers. “Now, I don’t know what your budget is, but over here we have copper and bronze.” Sure, funeral director, show your most expensive caskets to the unaccompanied teenager in a moth-eaten sweater. 1980s autobiographical detail: I don’t know how many of you have worn wigs in public or on stage. Between my new wave/punk/goth outings and being a drama geek, I wore them reasonably often in the late ’80s and early ’90s. In my experience, cheap or unkempt wigs—like you might find in a toy box—are conspicuous in person, and would get a child exactly the kind of attention El can’t afford. There are plenty of possible genre inspirations for Hawkins Lab’s doomed researcher’s name, but Mass Effect’s Lt. Commander Shepard or for that character’s namesake, Alan Shepard, seem most likely. As this episode closed on Hopper cutting through the lab’s fence, I started yelling, “Maybe tell somebody what you found! Or where you’re going! Anybody! And did you forget about the 100 cameras?” David O’Bannon isn’t wrong; if this were real life, Hopper would get them both killed. Stephen King corner: The title of “Chapter Four: The Body” pays homage to the Stephen King novella adapted into the film Stand By Me. Psychic nosebleeds are such a common notion, I didn’t even have to puzzle out the TV Tropes name (it’s psychic nosebleed, what else?) But like Brenner’s LSD experiments and his faux-fatherly coaxing, El’s could be straight out of Firestarter. (Though only the movie, not the book, right?) The Statie guarding the morgue is reading Cujo, in which [spoiler, really big spoiler] a desperate siege ends with a mother risking her life to save her son’s. She thinks she’s succeeded… but she hasn’t. Speaking of spoilers: Many of your fellow commenters are pacing themselves, watching Stranger Things episode by episode, and so am I. If you comment on any given episode’s review with revelations about upcoming episodes, please add a spoiler warning.